AUTHOR: Roy Friedman is a computer software engineer from Lexington, Massachusetts. He holds a Bachelor's degree in Mathematics from the massachusetts Institute of Technology and a Master's degree in Engineering from Northwestern University. His professional career has included ten years of system software design as well as teaching computer science and writing for computer magazines. Mr. Friedman has been a regular tournament backgammon player since 1985. He is considered one of the top players in New England and one of the game's leading analysts. Notable tournament achievements include second place in the 1988 New England Championship; first place in the Open Doubles at the 1987 Labor Day Tourney in Louisville, Kentucky; and first place in the Open Jackpot at the 1987 Children's Hospital Benefit in Cambridge, massachusetts. In addition, he received the New England Backgammon Club's 1989 "King of Monday Night" award for winning the most prizes at thirty-five weekly tournaments held throughout the year. 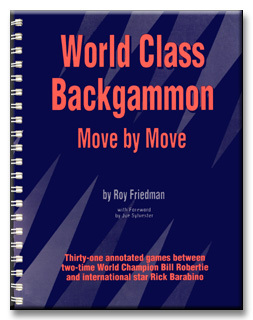 Mr. Friedman has conducted extensive computer analysis in the area of backgammon match equities. He developed the computer software that generates the match equities used in this book. This software produces match equities for any length match, allowing for adjustments in skill differences between the players. The software also analyzes rollout data for a given backgammon position from the perspective of any match score, showing how the effect of the match score alters the appropriate doubling-cube actions. Mr. Friedman lives with his seven-year old son, Seth, who was named the top backgammon player in his school class.